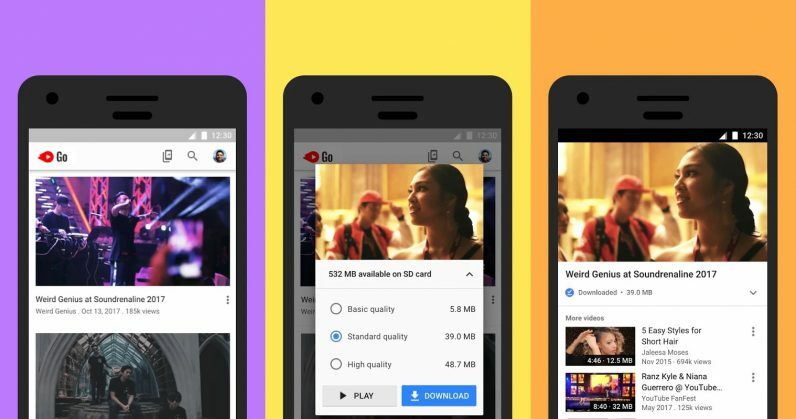 Google has made its lightweight YouTube Go app available to Android users in more than 130 countries, making it easier to enjoy videos on the platform on spotty connections. The app first went live in India a year ago, and came with features to let you download videos to watch offline, as well as beam them straight to other devices without the need for a data connection. That’s handy for people who have intermittent access to the web, like Wi-Fi at railway stations and offices. Google rolled it out to 14 more countries over the past year, and today, it’s made YouTube Go available in more than 130 countries. It’s also updated the app with the ability to stream videos in high quality, and get more personalized recommendations when you pull down on its home screen. YouTube Go is part of the Android Go suite of apps, which is designed for use on low-end devices with limited memory and storage. It joins others like Maps Go and Files Go, and will be bundled on phones with the optimized OS. India’s Micromax promised to launch a $30 Android Go-based handset by the end of January, but it hasn’t yet surfaced. Meanwhile, local carrier Reliance Jio is partnering with chip maker Mediatek to release a similar device, and it’s likely that the firms will have something out in stores by the end of this quarter. Find YouTube Go on Google Play, or, if it isn’t yet available in your country, sideload the app by downloading it from APKMirror.